For the Love of Woodlands! An online Facebook group came together recently to do a voluntary ‘paint over’ at Woodlands Hospice. The Decorators Forum is a national group who share hints and tips on decorating and painting. Wanting to increase their profile they decided to do some charity work. Craig Lyness, a member of the group, knew of Woodlands Hospice, based on the Aintree University Hospital site in Liverpool, as his Mother-in-law Lesley Halligan is a volunteer at the Hospice. Craig contacted Woodlands to ask if we needed any painting doing. Having had to abandon plans last year to paint the whole Hospice due to quotes that we could not afford we were delighted to accept the offer of any painting on a voluntary basis. No sooner had Craig put it on the Facebook Forum that Woodlands needed help and the members got behind the project. And so it grew and grew resulting in 39 painters volunteering at the Hospice over the first weekend in February. 300 litres of paint (Crown); 80 litres of paint/equipment (Coleman Brothers); brushes, rollers, paint trays (MyPaintBrush); masking tape, memberships for forum members and raffle prizes for participants (Decorating Supplies Ltd and Tesa); filler, paint mates, Zinzer products and goodie bags of products and sundries (Repair Care, Betsey,Tor Coatings, Ciret Ltd, Prodec & Dunlop). In addition to the extensive array of materials donated we had 10 twin rooms for 2 nights of the ‘paint over’ week-end (Holiday Inn) to accommodate the painters who had travelled from across the country; Insurance cover for the activity (County Insurance) and free parking (Aintree Hospitals). 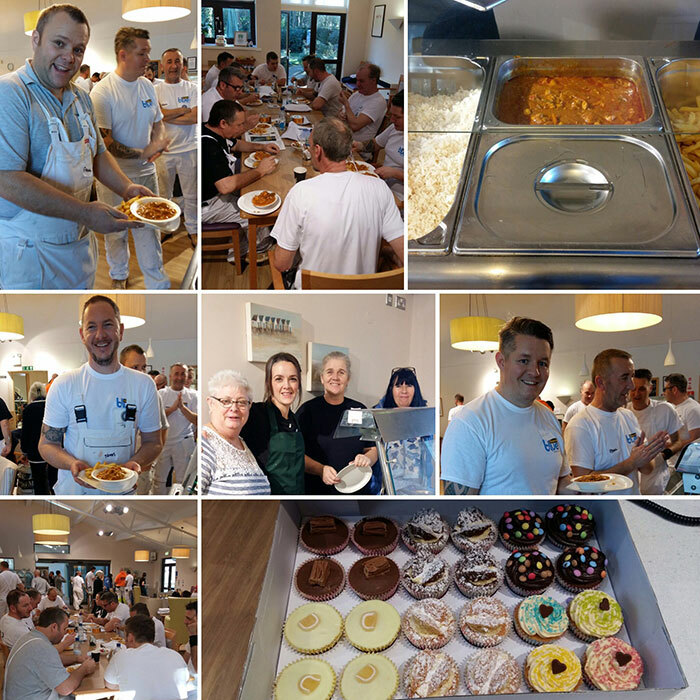 Woodlands Hospice catering staff provided breakfast and lunch over the two days and Marks and Spencer very kindly donated cakes and biscuits. 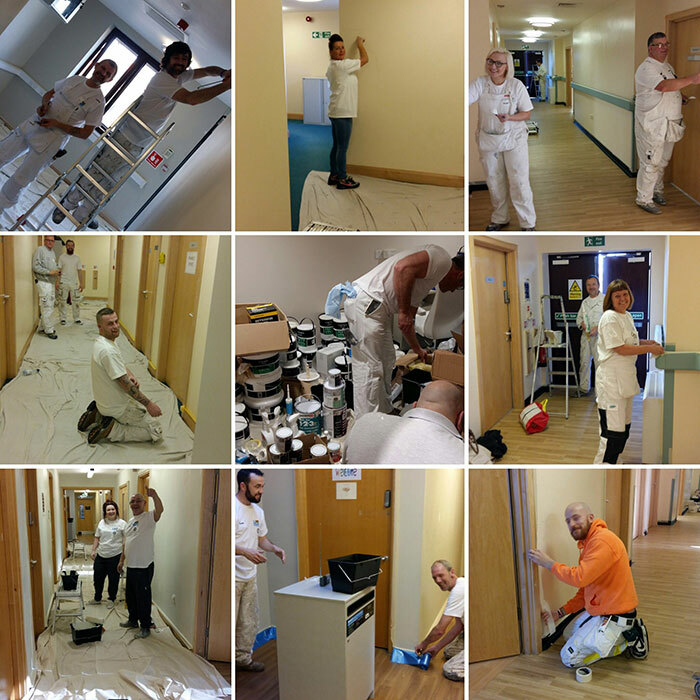 Rose Milnes, Chief Executive at the Hospice said: “Painters came from far and wide and locally too with 33 on day one and 17 on day two, all of whom gave their time and expertise free of charge. They painted double the areas we first anticipated because we had such a fabulous response. We are very lucky to have been chosen for their first charity team effort and delighted with the kindness shown and the team spirit of the Forum. They were great painters but also very caring, kind and very respectful of our environment. Patients, families, staff and volunteers love the new look and the freshness has given us all such a lift! In addition to the painting there was a real buzz at the Hospice leading up to and during the week-end. We were absolutely delighted that ITV Granada Reports and BBC Northwest Tonight covered the event giving due recognition to everyone who kindly took part to make it such a successful venture”. Ian Pilkington, one of the painters who took part in the week-end, created an online just giving page for Woodlands (http://­www.­justgiving.­com/­Ian-Pilkington3) in the name of the Decorators Forum which has raised £2,900 including gift aid. Ian said: “We came from all over the country for what was a truly magnificent week-end. We did what was asked of us plus a bit more. We had tears and laughter and made friends for life. The staff at Woodlands are amazing and we thank them for having us”. Ian also extended his thanks to all who have donated which has made such a difference to so many people.